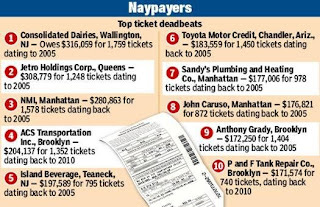 Each year, NYC releases data on the worst parking ticket scofflaws in the city. Ordinarily the list is comprised solely of businesses with large numbers of vehicles; however, this year's list includes two individuals with over $175,000 in violations each. According to the NY Post, neither man could be located at the addresses on file with the Department of Finance. While neighbors sided with the drivers, citing confusing parking signs near the local school, Finance Commissioner David Frankel was unsympathetic. 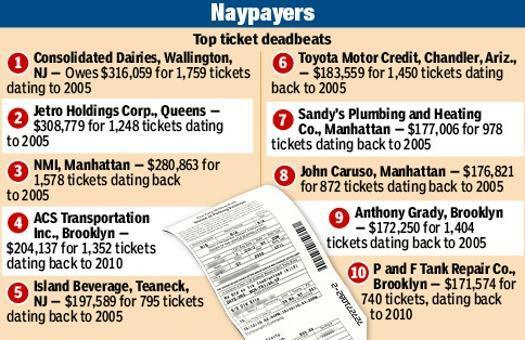 Ticket agents issued approximately 7.4 million tickets worth $466 million in revenue, $46 million less than the previous fiscal year. The large difference is being attributed to the extended parking holidays in effect after Superstorm Sandy.